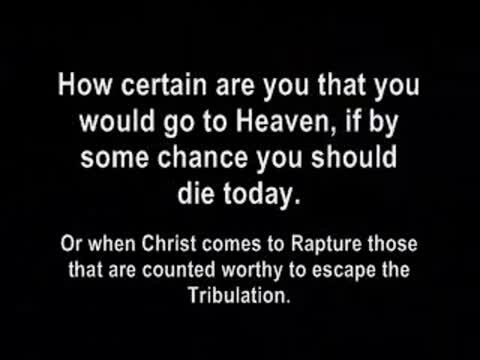 If by some chance that you died today, do you know where you would spend Eternity? Would it be Heaven or would it be hell? If the Lord came today would you be caught-up or would you be left behind? If you are not certain then video below will lead you through the prayer of salvation. Jesus is the Way, the Truth, and the Light. No man comes to the Father except by Him! Go to Video-Prophecy page and click on Salvation Prayer. But take heed to yourselves, lest your hearts be weighed down with carousing, drunkenness, and cares of this life, and that Day come on you unexpectedly. For it will come as a snare on all those who dwell on the face of the whole earth. Watch therefore, and pray always that you may be counted worthy to escape all these things that will come to pass, and to stand before the Son of Man.